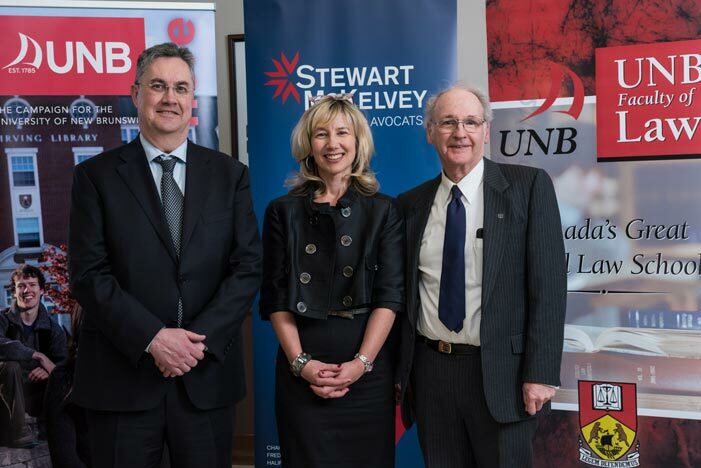 Stewart McKelvey, Atlantic Canada’s first regional law firm, today announced it is furthering its commitment to UNB law students with a leadership gift of $200,000. This donation will support the Frank Covert and Stewart McKelvey scholarships and create a new scholarship to promote and encourage diversity among the entering class. Student support is a significant part of UNB’s $110-million fundraising campaign, It Begins Here, which was launched in November. Fully one-half of the campaign goal – $55 million – will be dedicated to student financial support, funding scholarships, bursaries and programs to expand accessibility. Stewart McKelvey proudly celebrates over 25 years of innovative leadership as Atlantic Canada’s first and largest regional law firm. With a distinguished heritage reaching back to Canada’s confederation, the law firm has established an international reputation for generating results. Since becoming the first regional law firm over 25 years ago, Stewart McKelvey has grown to become one of the 20 largest law firms in Canada.